Continuing on from the tip of the Bruce Peninsula at the mouth of Georgian Bay is the pristine Fathom Five National Marine Park a protected portion of Lake Huron in Ontario, Canada littered with shipwrecks and watched over by several historic lighthouses. 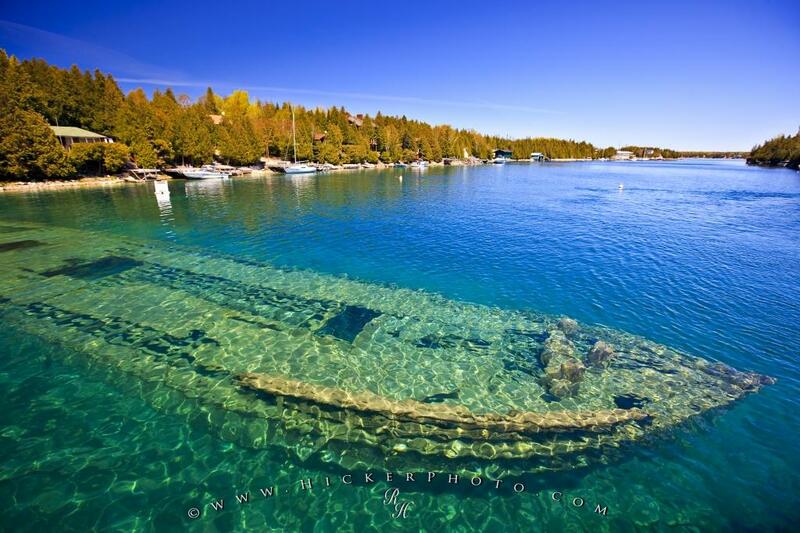 One of more than 20 shipwrecks found in the Fathom Five National Marine Park in Ontario, Canada. The Sweeptstakes was a schooner ship built in Ontario ca 1867. Today the shipwreck can be viewed a number of ways including by scuba diving, or by taking a boat tour of the Fathom Five National Marine Park. Although it is not permitted to enter the shipwreck when diving, the exterior can be explored. The Sweepstakes was originally damaged off Cove Island. The wreck was then towed to its current resting place in Big Tub Harbour and sank in September 1885. Photo of a shipwreck in Big Tub Harbour in the Fathom Five National Marine Park, Ontario, Canada. ... Outbound shipping transported goods produced in Georgian Bay for large urban centres. I photographed this photo with the digital SLR camera model Canon EOS-1Ds Mark III, aperture of f/5.6, exposure time of 1/80 sec. on ISO 100, as always I used a original Canon Lens, the focus lenght for this picture was 16mm.